This week's Tech Tuesday takes us to the Art Lab at our CORE/Labor Source hub in Longmont, where they're putting a new spin on a (relatively) old twist. 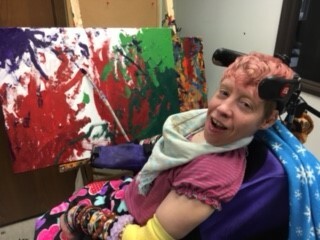 Some time ago, we had implemented adaptive brushes for people to use in Art Classes, allowing individuals with mobility challenges to reach the canvas with their paintbrushes and create their own masterpieces (see Shelly painting pictured above). Now, we've added a little conductive tape, and voilà! 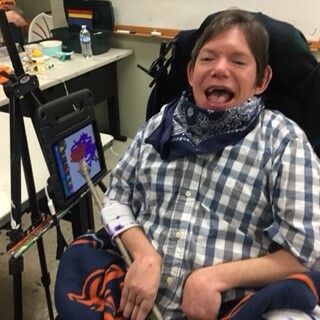 An adaptive stylus for painting on an iPad. Now project the image on the iPad through a projector, and Toby (pictured below) can see what he's doing in fine detail right in front of him. Excellent work, team!